This week, U.S. Defense Secretary Jim Mattis embarked on a visit to Vietnam. Though the headlines focused on the development itself, its significance should be understood in the broader context of U.S.-Vietnam defense ties, which have continued to deepen during the Trump administration despite lingering concerns. As I have observed before in these pages, over the decades, U.S.-Vietnam defense cooperation has slowly grown to encompass areas including maritime security, humanitarian assistance and disaster relief, and peacekeeping. This realm of the relationship has deepened further across the board under the Trump administration, even amid some lingering concerns about wider aspects of the administration’s Asia policy and some challenges Vietnam has been facing in terms of its own domestic and foreign policy. 2018 has seen the momentum on defense continue at a brisk pace. In terms of visits, for instance, U.S. Assistant Secretary of Defense Randy Schriver has so far paid three visits to Vietnam in the past nine months, with the last one being in early October for the U.S.-Vietnam Defense Policy Dialogue. On the same trip, he also traveled to Ho Chi Minh city and visited Military Hospital 175 that was recently deployed to South Sudan with the United Nations. 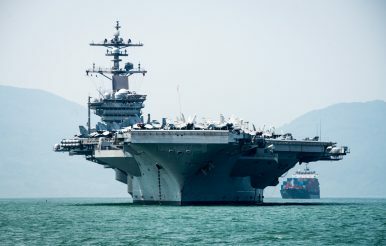 Other notable firsts have occurred as well this year, with a case in point being the visit of a U.S. aircraft carrier to Vietnam (See: “Why a First US Aircraft Carrier Visit to Vietnam Matters”). Seen from this perspective, Mattis’ visit to Vietnam this week, which he arrived for on Tuesday, was just the latest boost in ongoing U.S.-Vietnam defense ties. Optics-wise, this his second trip to Vietnam in less than a year following his January trip, which speaks to the role Washington sees for Hanoi within its wider approach to Asia. The fact that this is coming just before Mattis’ scheduled voyage to Singapore later this week where he will take part in the Association of Southeast Asian Nations Defense Ministers’ Meeting Plus (ADMM-Plus), has also cast the visit in a more regional spotlight, especially with the ongoing conversation on Southeast Asia’s role within the wider U.S. Free and Open Indo-Pacific (FOIP) strategy (See: “Trump’s Indo-Pacific Strategy: Confronting the Economic Challenge”). Substantively, while much of the focus in Washington has been focused on what this trip means in the context of U.S.-China rivalry given that Mattis’ planned visit to China had been nixed, the voyage is also an opportunity for both sides to highlight ongoing efforts at current and future collaboration. Of particular note is the remediation project at Bien Hoa air base, considering that addressing historical and war legacy issues from the Vietnam War era has long been part of U.S.-Vietnam defense relations and the relationship more generally. But while Mattis’ trip is certainly a boost for bilateral ties, it is important to emphasize that there are still a number of uncertainties and challenges for the relationship. Some of these are on the U.S. side, with wider concerns about the Trump administration, including whether Mattis himself will stay on in his current position – a question that was asked again during his media availability en route to Vietnam. Others relate to Vietnam’s own efforts to manage its domestic and foreign policy amid rising coercion from China as well as internal changes in its own domestic politics, brought to the fore recently by the death of its president. These broader realities are important to keep in mind when evaluating the significance of any single engagement in U.S.-Vietnam ties, and Mattis’ visit is no exception in spite of the gains that it constitutes for bilateral ties as well as U.S. strategy for the region more generally.